So this is how we’re going to play it, huh? I guess it’s all out on the table now. With an aging street fighter’s resilient faith in the same fighting mojo he had in his salad days, and like Robert Wagner putting the battery on his shoulder and daring someone to knock it off, John McCain has proved in the last week, and no more so than today, that he’s perfectly willing to make the heretofore dicey issue of age an issue in this year’s Presidential campaign. GI BILK: From war hero to war zero. While McCain was busy in California deriding his presumptive opponent’s youth and experience, his colleagues in the United States Congress were busy doing the business of righting the wrongs of the Bush Administration treating with more indifference than they treat their trash collectors the men and women who have been fighting their wars, and coming home to little more than a handsome lump of coal and the promise that they’ll get the blink of an eye with their loved ones before they’re heading back into harm’s way–and God help them if they get hurt and have to be shipped back to an underfunded military hospital. After passing the House last week by 90 votes, the 21st Century GI Bill of Rights cleared the Senate today by a whopping 75 to 22 votes. The bill was introduced by Virginia Senator Jim Webb shortly after his narrow and surprising win over Senator George Allen a year and a half ago. Webb is a decorated Vietnam vet and a former Secretary of the Navy under Ronald Reagan and had changed his party affiliation to Democrat shortly before the 2006 election. Webb was a maverick for much of his professional and military career. He resigned as Reagan’s Secretary of the Navy in 1988 rather than accede in orders to reduce the size of the naval fleet, which he wanted to increase to 600 ships. In 1994, he endorsed Democrat Chuck Robb in his Senate campaign against Webb’s fellow Marine Oliver North, but in 2000, he endorsed George Allen over Robb. It was that impassioned anti-war zeal that gave birth to petition drives urging Webb to challenge George Allen for the Senate in 2006, and in tribute to his son, Jimmy, who was serving in Iraq, wore his son’s combat boots every day of the 2006 campaign. After shocking Allen in November 2006 and his inauguration in January 2007, Webb hit the ground running using his new position in a new Democratic majority not only to opposing the war but to seeking some tribute for the veterans who were being so woefully ignored and seeing their hospital and benefit funding slashed under George Bush. The original GI Bill, implemented after World War II, was not only a huge and just reward for the Veterans who gave the prime years of their lives and were lucky enough not to have their entrails spread all over Europe and the Pacific, but was a huge boon for the American economy, ultimately resulting in $7 in the U.S. economy for every $1 we put into the GI Bill. It offered low- or no-interest home loans and full-ride schooling, among other benefits. It’s been peeled like a carrot since the 1970s. Since we deployed our troops to Afghanistan in 2001 and Iraq in 2003, the Bush Administration hasn’t increased benefits as a reward for our men and women who are going to the mats at Bush’s behest after 9/11, but has instead continued to eviscerate the military’s already meager educational benefits, and slashing funding for medical benefits and Walter Reed Hospital. This is like asking a neighbor to donate his compatible blood for your sick wife and swiping his wallet while the needle’s in. 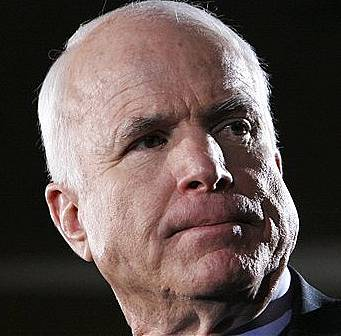 No one should understand the sacrifice of military service and the betrayal of the Bush Administration better that John McCain–who gave five years of his own life being tortured by the Vietnamese. But there were three conspicuous absences in Washington, D.C. today when the 21st Century GI Bill of Rights came up for a Senate vote. One of those absences was, sadly, Ted Kennedy. Another was an unexplained absence by Oklahoma Republican Tom Coburn. The third? Our erstwhile military hero, Senator John McCain. Senator Obama prefaced his remarks about Senator McCain’s absence with a respectful nod to his service, but questioned rightfully why John McCain went the most self-serving and flaccid route in addressing this bill by neither voting for nor voting against it, and attending a California fund-raiser instead. McCain has come out against Webb’s GI Bill, saying it’s too costly and would jeopardize re-enlistment, because the educational benefits would be too tantalizing to keep the troops in the military. That was a sound argument for plantation owners not offering weekend passes to their slaves, but even to give John McCain and his tiny minority the benefit of the doubt, what does a no vote on the GI Bill do for initial enlistments, besides encouraging the lowering of standards and the continued enlistment of felons and morons in order to keep a viable military? I’m just curious.